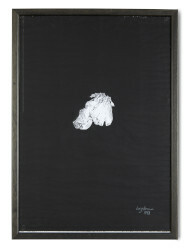 Signed and dated on the left bottom corner by the maker, this is the forth part of four framed works on paper which document the two wedding dresses which were selected and deconstructed to make Wedding Cage. 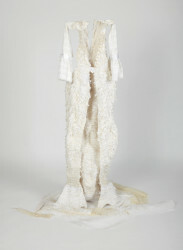 As a group, these Cast-offs make reference to motion picture frames, as the dresses float, divide and become one. Initially the two wedding dresses were laid out flat and photographed in different positions. These photographs were then photocopied. 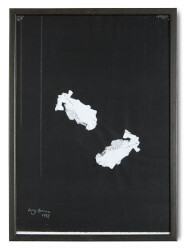 In turn these black and white photocopies were then cut and collaged to make ‘Wedding Cages’ and 'Cast offs’. Hands, scissors and spatula are used in making. 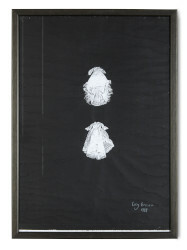 Wedding Cages' Cast-offs (in four parts) - 4 of 4, Lucy Brown, 1998, Crafts Council Collection: AM457. Photo: Stokes Photo Ltd.